Rudy’s right. Trump should skip the debates. 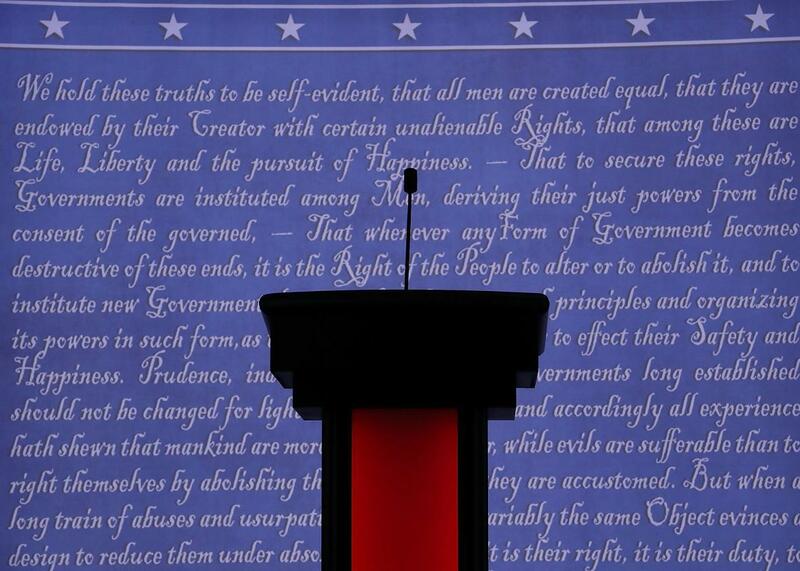 How Trump’s podium should look when he, smartly, does not show up for the next debate. Although it’s unlikely that Monday night’s debate at Hofstra University will completely upend a terrifyingly close contest between Hillary Clinton and Donald Trump, the first head-to-head event of the season was almost certainly the best thing that has happened to Clinton in well over a month. With two debates remaining between the candidates, the question is: Should Trump actually attend the remaining showdowns? If I were Donald Trump I wouldn’t participate in another debate unless I was promised that the journalist would act like a journalist and not an incorrect, ignorant fact checker. Lester Holt did fine Monday night, but Rudy’s right. If Trump were to do what he normally does and distinguish the interests of himself and his country, he would skip the rest of the debates. Canceling would prompt some bad press and even (briefly) more concerns about his suitability for the presidency. But that’s preferable to two more nights like the one he had on Monday, especially since the American people have repeatedly proven, both before and during the rise of Trump, that they don’t care as much as one might think (or hope!) about the violation of political norms. For this unfortunate reason, declining to debate Hillary Clinton again might just be Trump’s best strategy. Momentum may not exist in politics or even sports, but try convincing an anxious news junkie of the former and see how far you get. After a successful convention and a number of missteps by her opponent, Clinton had been flailing recently, with concerns about her health and ethics somehow overshadowing the fact that she is running against a vile authoritarian. The Hofstra debate, however, was a clear-cut victory for her. Not only did she appear calm and steady despite Trump’s repeated interruptions and nonsensical outbursts; she also deftly attacked his birtherism and business practices, thereby preventing him from ever developing a rhythm for his (powerful, one suspects) theme on her as symbol of the status quo. Would another debate be much different? Decoding whether Trump is capable of doing something, such as preparing for the next debate, is always a difficult task, so it’s near impossible for any nonphilosopher or nonexpert in the mechanisms of the universe and freewill to say whether Trump “could” have prepared for last night’s debate or “might” be capable of doing so next time. What is certain is that he didn’t, and as the night wore on his answers got closer and closer to gibberish, his lack of knowledge strikingly apparent. I don’t see that changing. Can his campaign withstand the repercussions of two more bad performances and the resulting effect on his psyche? And why should it? As painful as it is for pundits and television executives to admit, skipping the debate is probably the right thing for Trump to do. There remains very little evidence that Americans punish politicians for procedural decisions, even if they violate long-held norms. (Yes, John McCain endured some bad press when he suggested postponing a debate with Barack Obama because of the financial crash. But Trump pulled out of a primary debate, to little effect.) And there’s months of evidence that Trump can survive without a single strong debate performance. If he has been more successful over the past month, it is in part because he has appeared only in venues, such as Fox News, that are friendly and controllable. As occasionally ridiculous as they are, the debates remain one of the better ways for viewers to learn about the candidates. If Trump walks away, he just might benefit. And as is always the case when he benefits, everyone else loses.